David Lee Roth Nugget is screeching "CRISPY!" whilst Afro Tommy Lee Nugget is uttering "CRUNCH!" These are so freaking good. Even I thought they reminded me of something familiar, just couldn't put my finger on it. Bugles don't really come to mind for me either. I don't know. Salty, crunchy, slightly greasy. Just really really good. These were too greasy for me so I toasted them in the oven. Lots of oil came out. They became super crunchy, too! I bought these because lots of people have been raving about them. As soon as I put them in my mouth I thought they were way too salty (and I like salty snacks). I also thought the texture was too dense. The overall flavor reminded me of a cross between a frito and a cornut. Not a fan. I like these, but being that they're so greasy, I feel a bit guilty after eating them. I didn't realize they'd be fried. I probably wouldn't have bought them if I knew that. They're pretty salty-tasting too, although the nutrition labels shows that there's only 75mg of salt per serving. Tastes a lot saltier than that. The japanese on the front says "ku-ri-su-pii" and "ku-run-chi" (crispy, crunchy) from left to right. I knew I could rely on What's Good at Trader Joe's to tell me why these tasted so dang familiar! EXACTLY like Bugles! Why? How?? 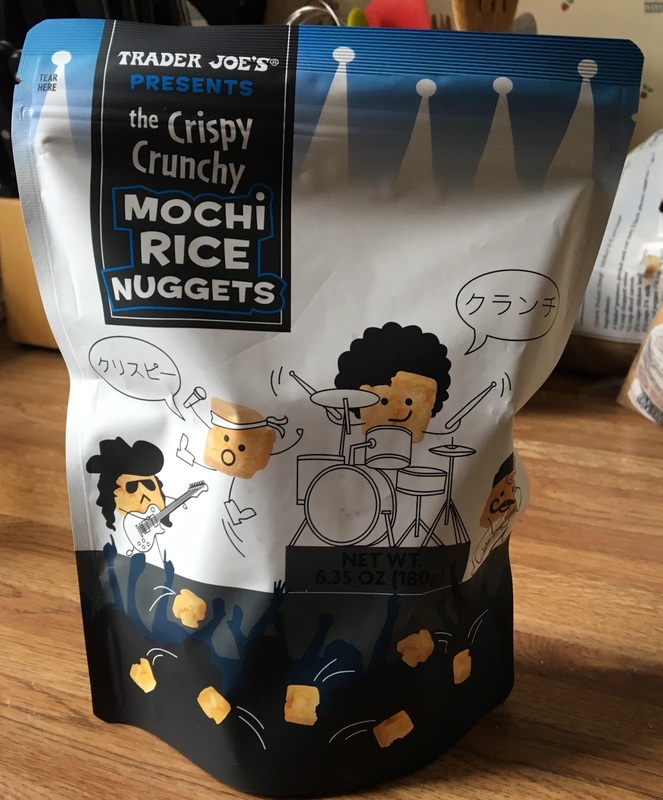 Altogether a very mysterious snack, but I feel much happier eating these yummy bites now that I placed that eerily familiar flavor.